Part 1 Principles and types of fatigue in textile fibres: Basic principles of fatigue; Tensile fatigue of textile fibres; Flex fatigue of textile fibres; Torsional fatigue failure in fibres; Biaxial rotation fatigue in textile fibres. Part 2 Factors affecting fatigue life and fatigue case studies: Effect of structure-property relationships on fatigue failure in natural fibres; Effect of textile processing on fatigue; Environmental aspects of fatigue; Fatigue of polymer-matrix textile composite materials; Fatigue damage in structural textile composites: Testing and modelling strategies. Fibres are used both for traditional textile applications as well as in advanced technical structures. Understanding the fatigue processes in these fibres can suggest ways of eliminating or reducing the probability of unforeseen failures. 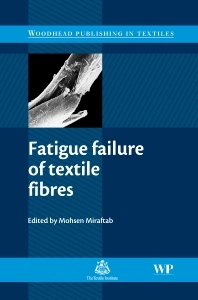 This book addresses key aspects of fatigue failure in textile fibres. Part one explains the different types of fatigue failure in textiles such as tensile, torsional and flex fatigue. It describes the mechanisms of each type of fatigue and illustrates the kinds of fatigue failure that can occur. Part two moves on to explain the factors that can affect fatigue life and fatigue behaviour. It underlines the relationship that fatigue has with the environment and looks at testing and modelling fatigue in such areas as polymer matrices. Chapters relate actual fibre fatigue failures to those of laboratory tests and the way they influence mathematical modelling to predict potential failure. With an international range of contributors Fatigue failure of textile fibres is key reading for textile engineers, academics, textile technologists, fibre scientists and all those concerned with the topic of fatigue failure in textiles and textile-based assemblies.